Whether in group format, solo, or as leader, Kris Davis is on the rise. Her output over the last 15 years is numerous, yet not prolific. Instead, this Vancouver-born, New-York-based pianist and composer focuses on quality over quantity. Further, like many of her collaborators in the Big Apple’s creative music scene, she is not afraid to eschew the jazz label with which she is often classified. And speaking of those collaborators, the lineup on this release is rather unique. Joining Davis on piano are Ben Goldberg, Oscar Noriega, Joachim Badenhorst, and Andrew Bishop on various clarinets, her husband Nate Radley on guitar, Gary Versace on organ, and Jim Black on drums. The combination of four clarinets, as well as both piano and organ, helps Davis establish a singular sound. 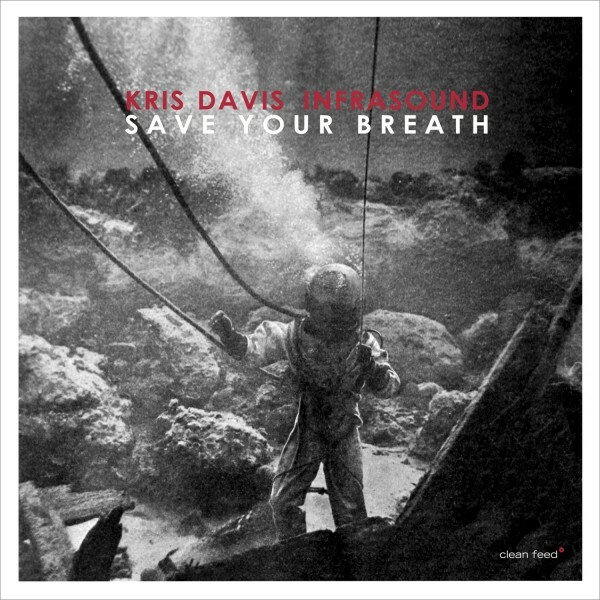 Indeed, Save Your Breath features solid, contrapunctal composed pieces – orchestral music in the guise of creative jazz. While I am not certain as to whether Davis ever played with Anthony Braxton or studied under him, one can hear a subtle Braxton influence here, perhaps due to Davis’ hanging in circles of Braxton’s ex-students and collaborators, such as Mary Halvorson and Tomas Fujiwara. But what lifts this recording outside of the jazz pigeonhole is Davis’s use of texture and space. Rather than just laying down individual lines, each musician is contributing pieces to an overall theme or sonic landscape. For instance, the opening track, Union Forever, resembles a cross between chamber music and French progressive rock. Not to say, however, that the group doesn’t break out from time to time, especially on the aptly-titled Whirly Swirly, or go all freak-out, such as on The Gost of Your Previous Fuckup. And Davis is not beyond a spacious interlude, such as on the title track, that borderlines on the electroacoustic. Davis has been releasing solid material for years, but her trajectory is on the upswing – she keeps getting better and better. Save Your Breath is one of the stronger albums of 2015. A new musical event highlighting cutting-edge sound; unclassifiable modern music, informed by jazz and improvised forms, inspired by hip hop, funk, spectralist composition, minimalism and punk… Fiercely original, spontaneously conceived and deliriously human music. 8.00pm: In Tiny Montgomery: Bizingas plays the Blues featuring: Brian Drye (trombone/compositions), Kirk Kniffke (cornet) and Jonathon Goldberger (guitar). With special guests Hank Roberts (cello) and Tom Rainey (drums). In this special performance Brian Drye’s Bizingas will premiere a new set of “chamber folk-porch blues” pieces. No electronic synths and gadgets for this acoustic, pared-down set. 11.00pm: In Threes Main Bar: FOLKLORDS featuring: Peter Hanson (saxophone), Nathaniel Morgan (saxophone), Owen Stewart-Robertson (guitar), Jason Ajemian (bass, vocals and compositions) and Jason Nazary (drums). FOLKLORDS is the sound of an outstanding group of New York City improvisors performing six conceptual, visual & sonic landscapes. Meditative Mingus ballads, imaginary conversations between Sun Ran and Thelonious Monk, poetic takes on pop culture, and an elegy for Malachi Ritscher are transmitted via Ajemian’s unique notational methodology. 12.00am: In Tiny Montgomery: Hearing Things featuring: Matt Bauder (saxophone), JP Schlegelmilch (organ) and Vinne Sperrazza (drums). Hearing Things plays original music by Matt Bauder. They heard that sound travels through a world where geography and time are fluid. Their hobbies include surfing the Red Sea and stripping at the drive-in, but they are equally comfortable relaxing with a good book while the technocrats fistfight in the streets. Prudes, ghosts and tittyshakers; the hustlers and sweet-talkers alike, all will join hands and sway to this brand new beat. Bauder himself has been an active member of the Brooklyn music scene for the past ten years where he’s always surprising listeners with his diverse projects when he’s home from touring with bands like the Arcade Fire and Iron and Wine. Bassist/composer William Parker has a new three-CD box, For Those Who Are, Still, out next week on AUM Fidelity. (Buy it straight from the label for $30, or $50 for a copy signed by Parker.) It contains three extended pieces for larger-than-usual ensembles, and a shorter piece built around vocalist Leena Conquest. Some of the music dates back 15 years, while the other pieces are more recent. William Parker 3 CD Epic with Hamid Drake/Rob Brown/Cooper-Moore..! Darius Jones New Quintet! Liberty Ellman With Steve Lehman/Jonathan Finlayson..! Two from Haino Keiji‘s Seijaku! Korekyojinn & PYN with Tatsuya Yoshida! New from ForTune: Dennis Gonzalez‘ Yells at Eels! Marco Eneidi Steamin’ 4! Rudi Mahall’s Fusk! Waclaw Zimplel Orchestra! Georg Graewe Solo! Aram Shelton/Fred Lonberg-Holm/Frank Rosaly! Todd Capp/Kurt Ralske Mystery Train! Arnold Hammerschlag Quintet on Skirl! Max Eastley/Derek Bailey/Feminist Improvising Group! Nurse With Wound and More! 5pm: LEAP OF FAITH: PEK – clarinets, saxes, double reeds / GLYNIS LOMON – cello, aquasonic /STEVE NORTON – clarinets, saxes / YURI ZBITNOV – drums! 6pm: PLANISPHERE 4Tet: GUILLERMO GREGORIO / NICOLAS LETMAN / LESTER ST. LOUIS / JOANNA MATTREY – Clarinet/Bass/Cello/Violin All New Music!